I have two computers and one smartphone that I use regularly. And while that's more devices than I relied on just a few years ago, it's likely fewer than many of you use. Still, I sometimes have trouble finding the documents and data I need, wondering if I last viewed that video on my phone, or whether I saved that spreadsheet to my laptop. And accessing my files is just half the battle: I also need to back everything up, keeping all of my data secure in case of a lost or malfunctioning device. SafeSync's settings page makes it easy to see which folders you're syncing, and whether all of the contents have been synced. It just seemed like so much work. Until I came across TrendMicro's SafeSync, that is. This cloud-based backup service makes it a breeze to back up my data, and to access it across multiple devices. SafeSync is both a downloadable application and a cloud-based service. To use it, you sign up for an account and download the desktop client to as many as three computers. SafeSync also offers a mobile client, which is available for iOS and Android and can be installed on an unlimited number of mobile devices. Once the desktop client is installed, it creates a SafeSync folder on your computer, in which you can store any type of file. Anything you place in that folder is automatically synced to your SafeSync account, which can be accessed from any Web-connected device. If you don't want to move your data around, you don't have to. 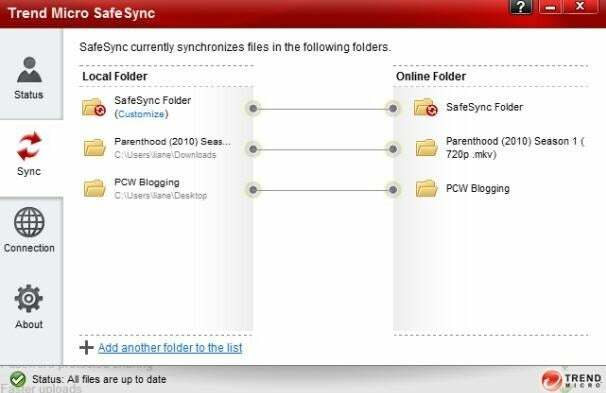 You can turn any existing folder into a SafeSync folder by right-clicking on it and selecting the SafeSync option that automatically appears in the menu. Once your data has been synced to your SafeSync account--a process that can take some time, depending on the size of the files you're adding and the speed of your Internet connection--you can access them easily from any other device. I uploaded a 22-minute TV episode in HD that was stored on my computer and had to wait more than an hour for the sync to complete. But once it was finished, I was able to view the video file on my laptop and my iPhone (using SafeSync's free iOS app) without having to download it. TrendMicro streams the file from within SafeSync, so I was able to view the video on my iPhone, even though it was a format not compatible with iOS. SafeSync makes sharing files easy, too, creating secure links that you can send. It also allows you to post content to sites like Facebook and Twitter, too. I actually found its sharing features superior to those of 4Shared, a cloud-based app that is focused around sharing content. I also prefer its backup and Web-based storage features to those of services like Box.net, though I do wish SafeSync had a free version comparable to Box's free 5GB service. (SafeSync offers a free 30 day trial, but after that it starts at $40 per year for 20GB of storage and goes up to $150 per year for 100GB of storage.) Still, SafeSync's ease of use, streamlined interface, and built-in security make this a service worth paying for. TrendMicro's SafeSync offers a simple and secure way to backup files and access them across multiple devices.